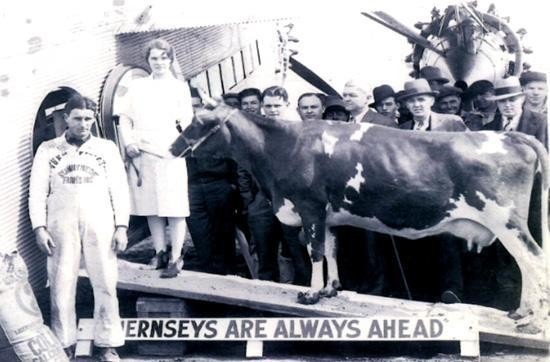 On February 18, 1930, the first cow to ever take flight ascended into the sky in a Ford Tri-Motor. As part of the celebration of the International Air Exposition in St. Louis, Elm Farm Ollie was flown from Bismarck, Missouri to St. Louis, a distance of 72 miles. Elm Farm Ollie was the first cow to take flight and the first cow to be milked on a plane. Putting a cow on a plane was a publicity stunt, but also an opportunity for scientists to study the affect of high altitude on a cow being milked. Elm Farm Ollie was a Guernsey cow who could produce large quantities of milk. It was said that Elm Farm Ollie was milked three times a day and was selected for the flight because of her ability to give lots of milk. Guernsey cows are orange-red and white in color and are used in dairy farming. On her epic journey, Elm Farm Ollie produced 24 quarts of milk. The milk was then put into paper cartons and parachuted down to the spectators below. One of the famous people who is rumored to have drank Ollie’s milk is Charles Lindbergh. Elsworth W. Bunce was a lucky man from Wisconsin who had the honor of milking Ollie and earned the distinction as the first man to milk a cow mid-flight. Weighing over 1000 pounds, loading Elm Farm Ollie onto the plane did not seem like an easy task. However, this cow was also selected for flight because of her docile and calm nature. Before the flight, Elm Farm Ollie was known as “Nellie Jay”. After making history she was given the moniker “Sky Queen”. Elm Farm Ollie day is celebrated every February 18 at the National Mustard Museum in Wisconsin. We hope you enjoyed your bovine aviation day!